…the tablescape! It’s my version of a tablescape that I have been eyeing on Pottery Barn’s web site this fall. The stars are my little collection of mercury glass pumpkins picked up at Tuesday Morning and Costco for $10 to $13 each. Woo hoo! Waaay less than their Pottery Barn counterparts! Once again, my ruffled burlap table runner is anchoring the centerpiece. You can find a detailed tutorial here. I am using my Chris Madden Felice plates…a favorite Goodwill find at $10 for a service for four…and my Gorham Octette pewter flatware and matching pewter napkin rings. An antiqued silver charger beneath the plates reflects the patina of the mercury glass pumpkins. My simple leaf place cards are scattered near each plate. I chose this simple option from among the place card styles that I showed you in a previous post. Yes…Granny…that’s me! :-) I’m just waiting to hear the two youngest say it! The glasses are simple wine glasses filled with a few faux acorns for now….really just for looks! lol Irish lead crystal glasses filled with sweet tea will replace them on Thanksgiving! What can I say? We live in the South! I am using the same candle arrangement that I had in my previous tablescape…my version of the faux deer antler candlesticks that I have been seeing. Want them! Maybe they will go on sale. In the meantime, my version will have to do! I always use sheds…found in the woods after shedding season. And here is the heart of the table…my centerpiece…mercury glass pumpkins with traditional mini-pumpkins and acorns scattered about. And…taa daa…my favorite new project! Ever since I saw the vintage wood platforms made from old bread boards on Pottery Barn’s web site, I have been plotting how to make one. And here it is! I am going to give you all the details in my next post in case you want to make one, too. I will be able to use it all through out the holidays! I am so excited! I added a vintage-y faded monogram to it, too! Love it! The best part…mine cost $5.00 compared to their $60! Woo hoo! Find a detailed tutorial here! Here’s a final look at my tablescape. I am really enjoying the contrast of the traditional orange pumpkins with my blue and white transferware on the hutch. I seem to go back to that combination over and over this fall. I am really looking forward to Thanksgiving! It will be a small dinner with high chairs pulled up at each end, too. I can’t wait! And just in case you are wondering where our co-host Baby Kitty has been lately, here he is…on his favorite new perch. Ever since we installed this kitty-cat window seat, he has claimed it as his own. He loves to watch the leaves blowing in the wind and the birds fluttering at the feeder. I do believe it’s his favorite season…and mine, too! How about you…do you love fall as much as I do? 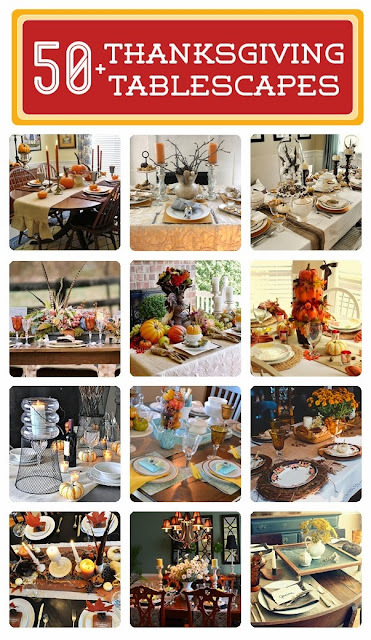 And just in case you are looking for more Thanksgiving inspiration, you will find over 50 tablescapes here on my Hometalk Fall and Thanksgiving Tablescape board! Now I never thought of using a bread board in a table setting! Brilliant - looks lovely. Love the cutting marks, too, the evidence of real USE. Great tablescape, Debbie. I love those mercury glass pumpkins, and I really love the blue transferware with it. LOVE those Chris Madden plates! Wish I could find some. Yes, I love fall so much! I am very excitedly waiting to see the post on how you made that wonderful wooden platform. When I first saw it I thought it was something old and precious! Love your tablescape - love the differing textures - burlap, wood, mercury glass. Super cool! I loved the Pottery Barn inspiration too but this is a fabulous knock off. Such rich colored board and I love the aged lettering. Way to go finding the mercury glass pumpkins at a good price. I love the pumpkins against the blue too! Very pretty! Gorgeous Pottery Barn knock off. LOve all of you beautiful mercury glass pumpkins! The bread board platform is awesome! Can't wait to see how you made it. Love your mercury glass pumpkins, too. Great prices! Happy Thanksgiving! Debbie, Love your pictures...such great ideas! Seeing this tablescape reminds me of a project I have been working on for my daughter's wedding. She wanted LOTS of silver looking candlesticks for the reception tables and I started buying really cheap old brass candlesticks. I found that if I painted brass with the mercury-mirror-spray paint, it makes the candlesticks look like old silver. This idea may have already floated around the blogosphere, but I just stumbled onto it while trying to spray some dollar store glass votives to look like mercury glass. We are getting so many great vintage-y wedding ideas from decorating blogs...keep up the good work! This is a true Pottery Barn reproduction tablescape!!! You have captured a truly stunning look with the candlesticks, deer sheds, burlap runner and now...the wooden board centerpiece!!! May you have a blessed Thanksgiving with your loved ones gathered around this beautiful table! Oh yes I love Fall. I am glad you will have the little ones at your table this year. Your table looks so happy and beautiful. What a score on your deals, and I look forward to seeing your tutorial on your wood centerpiece. This is such a beautiful table, I love all the touches like the acorns in the galsses. Love the runner and I love mercury glass. Just beautiful. Absolutely Beautiful!! I just Love all the detail you put into it!! Wish I had a Costco or Tuesday Morning close by I would love a set of Those Pumpkins at that Price!! I just love it when someone is able to successfully create a much less expensive version of something cool. Man, oh, man...you did a great job!!! There is no way I would be able to pay $60 for that platform, but for $5 and a little effort and creative input...can do! The mercury glass pumpkins look fantastic mixed with the wood grains, and I love the blue & white backdrop to the rich pumpkin colors. Your candles look so pretty...almost like butterscotch candy! The color is rich and wonderful! I like your antlers, too. I went antler hunting last year in February, but I never found anything. A friend felt sorry for me and just gave me some from around their property where deer routinely shed antlers. I think they're cool! I'm just blown away by the great price you paid for those dishes, too!!!!!! That was a terrific find! Have a wonderful Thanksgiving!!! Once again you've done it! It is purrfect! (sorry, Marigold made me say that!) I wish you the most thankful and love filled Thanksgiving. How fortunate are those gathered around your beautiful table. Love those pumpkins and wishing you a peaceful and Happy Thanksgiving. Lovely! Feels so good to knock off PB for less! Love you take on Pottery Barn and I like it, too! The mercury pumpkins and themini pumpkins are so perfect for this centerpiece. The embossed china is lovely and a terrific find. So glad you did this tablescape has creative ideas. Debbie, I love this! You know I'm hooked on all things Mercury glass these days! :) Beautiful! Beautiful, Debbie! I especially love the mercury glass pumpkins. I hope you have a wonderful Thanksgiving. Debbie you must have the best Good Will store on the planet!! Love the dishes!!! Also the Mercury pumpkins are a steal. Is this a current Tuesday morning find? Love it all! !